In the city we are blessed with many parks, particularly in the East End. There are quite a few of them, large and small – many of which were covered in the last issue of Beach Metro News. You may learn a little about some lesser-known parks, and maybe even a bit of history. Here we have the second installment of my roundup of the parks of the East End. They are not in any order of preference, though many of the larger parks were covered in the last issue. An athletic field between Kenilworth and Kippendavie south of Kew Beach Public School, it was the site of hundreds of athletic events, including training for the Olympics. It was named Pantry Park by the late, great Ted Reeve, who lived close by: “The original park looks about the size of my mother’s pantry.” Later the park was enlarged, but the name Pantry Park lingered on. This park at the end of Woodbine Avenue west to Ashbridges Bay Park was named after the Woodbine Racetrack that used to stand on the site. This park was named after the Ashbridge family, who came to the area as settlers in 1793. They were led by the matriarch of the Ashbridge clan, Sarah. She was one of the first women to petition the crown for several hundred acres and received them. The family home still stands at 1444 Queen St. E.
Cairns Avenue Parkette – At 93 Cairns Ave. Have you been here? The Edgewood Parkette at Dundas and Edgewood – if you sneeze you will miss it. The Ashbridges Eco-Community Gardens is near a police station – can you find it? Orchard Park is at Dundas and Maughan Crescent. The Maughan Crescent Parkette is again on Dundas. 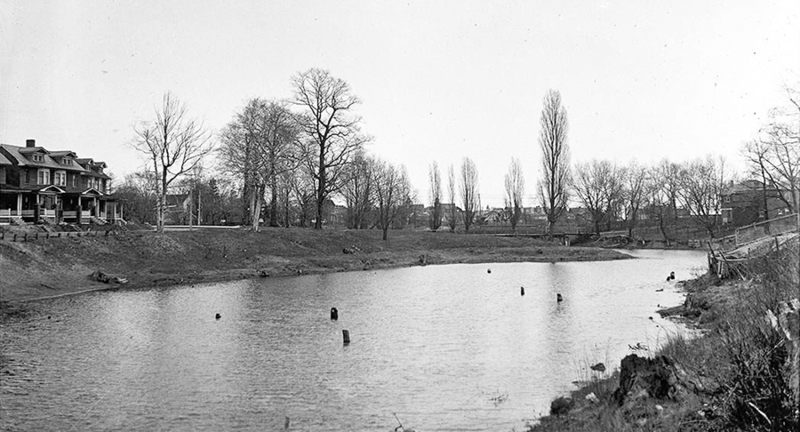 These last few parks had something in common: a small pond called Small’s Pond, named after one of the pioneers of the area and drained decades ago. Located at the rear of Maple Cottage at 62 Laing St.
At Dundas and Greenwood, this used to be the site of one of several brickyards in the area. Main and Danforth on the west side of Main, named after a retired citizenship judge and civil rights and labour union activist in our area. Can you locate this place, dear readers? Probably the most historic park in the area. Located at Main and Gerrard just behind Ted Reeve Arena, this was originally the Grand Trunk rail yard. Baseball, football and other sports began here more than 120 years ago. The Ed McCleverty Equal Access Playground is part of the East Toronto Athletic Field. This park was provided for equal access to children of all abilities, and was named for the guiding force in getting the playground built. Located on Norwood Road southwest of Main and Gerrard. This park has a long and varied history. It was originally called Benlamond Park, or Norwood Lea. This area was the estate of a landowner and developer in the East End, Benjamin Morton. In 1876 he and the founder of the Toronto Golf Club, James Lamond Smith, worked for the Bank of Upper Canada and formed a partnership to build developments in the East End, especially the Village of East Toronto. Morton used his personal park for many social events for the benefit of the people of the area. After he passed on the city bought the property and named it Norwood Park, where there was lawn bowling and now tennis courts. Here is a great little park hidden from general view, at the west end of Oakcrest Avenue, facing Woodbine. I wonder if one of our politicians is aware of this place? Located at Westlake and Stephenson Avenues close to Main and Danforth, it was named after Donald George Stephenson, a lumber merchant and the first reeve of the Village of East Toronto. Unfortunately, Panrty Park, a park with a long and storied history, will soon no longer be a park due to a backroom deal pushed forward by Mary McMahon. Who is this Joe McNulty? His opinions would have more credibility if he identified himself instead of hiding behind the name of the late wellknown Beacher Joe McNulty. Sheila Blinoff was the general manager of Beach Metro News where she worked for 40 years, so she has a good knowledge of the area. Like many other Beachers, she knew and remembers the late Joe McNulty. Iam a proud person who grew up in the BEACHES and recent you using the good name of Joe McNulty. Once a beacher always a beacher. Did you “Joe McNulty” ever live in the area? I have never heard of you and I have lived in the Beach my entire life. Are you sure that name isn’t an alias? I have lived my entire life in the Beach and have never heard of Sandy Richmond.